Hello all! It’s a surprisingly sunny and lovely day here in Vancouver, which somehow makes the fact that I am currently not eating bananas not seem quite so bad. Why am I not eating bananas, you ask? 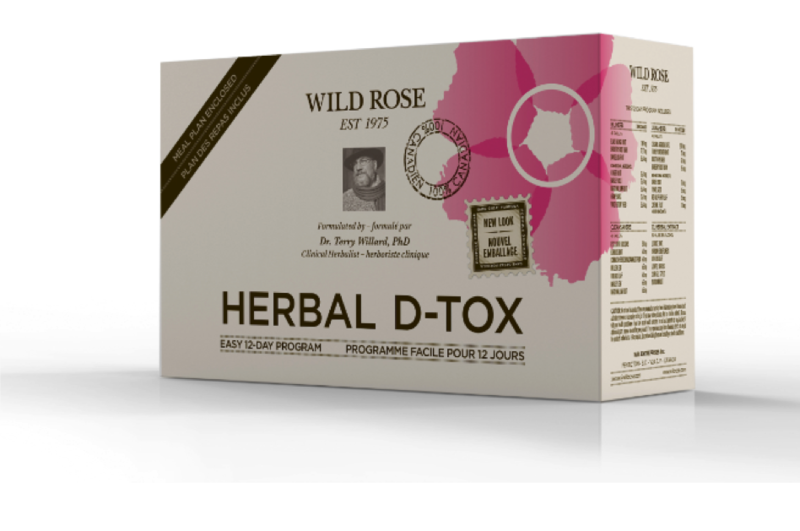 Well, a little while ago I came across the Wild Rose Herbal D-Tox, a natural cleansing and supplement kit. It’s meant to alkalinize the body, because there’s a belief that an overly acidic body can lead to digestive problems, general fatigue, and even cancer! I’m not super well-versed with the whole alkalinity deal so I won’t go further into detail here, but since I first heard about it, it seems like everyone’s been Wild Rose-in’ it up lately! I’ve seen friends on Facebook posting about it, read about it in countless blogs, and even stumbled upon “Wild Rose-Friendly” Pinterest boards. Everybody seemed to have so much energy and felt fantastic by the end of the cleanse. I became intrigued and delved a little deeper into it, and along with the supplement kit (which works mainly to cleanse your digestive system, if you get where I’m going) there is also a food guide that goes along with it. Foods are split up into an 80% category and a 20% category, and within those there are “most recommended” and “recommended” food choices. You can eat as much as you want while doing the cleanse, as long as you ensure that foods in the 20% category only take up 20% of your diet. The majority of the foods are alkalizing , with some of the more acidic foods making up the 20%. Wheat, flours of any kind, sugars (besides those naturally occurring in fruits and vegetables), and dairy are no-nos on the Wild Rose. It’s only meant to last 12 days so I asked a friend if she’d be interested, and she of course knew someone who had done it and really enjoyed it, so here we are on Day 3! We opted to leave out the laxative portion and just focus on eating un-processed alkaline foods. I’m also cheating a bit by having 2 of my pre-workout cookies each morning, so I’m not claiming to be Wild Rose-in’ it. So far I’m not feeling a whole lot different, but I’ve noticed a HUGE difference in my snacking. I normally will go for things like yogurt, energy bars, protein shakes, maybe some cereal….all things I’m not supposed to eat. I’ve found myself eating a lot more vegetables and A LOT more almonds. And for some reason bananas aren’t allowed. I guess maybe they’re acidic? I’m not really sure, I haven’t looked into it much because I feel like looking at a picture of a banana might send me into a banana frenzy. Aside from the lack of bananas I’m not feeling deprived at all. Just to give you an idea of the things that are acceptable, I’ve been having rice cakes with almond butter and an apple as my post-workout snack (totally breaking my belief of no fats post-workout here), giant green smoothies with spirulina have been my afternoon snacks (which surprisingly contain a fair amount of protein thanks to the spirulina! ), and dinner has consisted of chicken and vegetables. I’ve decided to track my food intake for the first little bit just because this is such a new way of eating for me and I found I was quite low in the protein department the first day. I counteracted that with an omelette for lunch yesterday and I’ll be having some tuna with my salad today. I’m not usually big on cleanses. I find them to be quite restrictive and not sustainable (hello juice fasts? ), and for the general population who isn’t very well-versed in nutrition I feel like this can lead to short-term undernourishment and disordered eating patterns if kept up for the long-term. 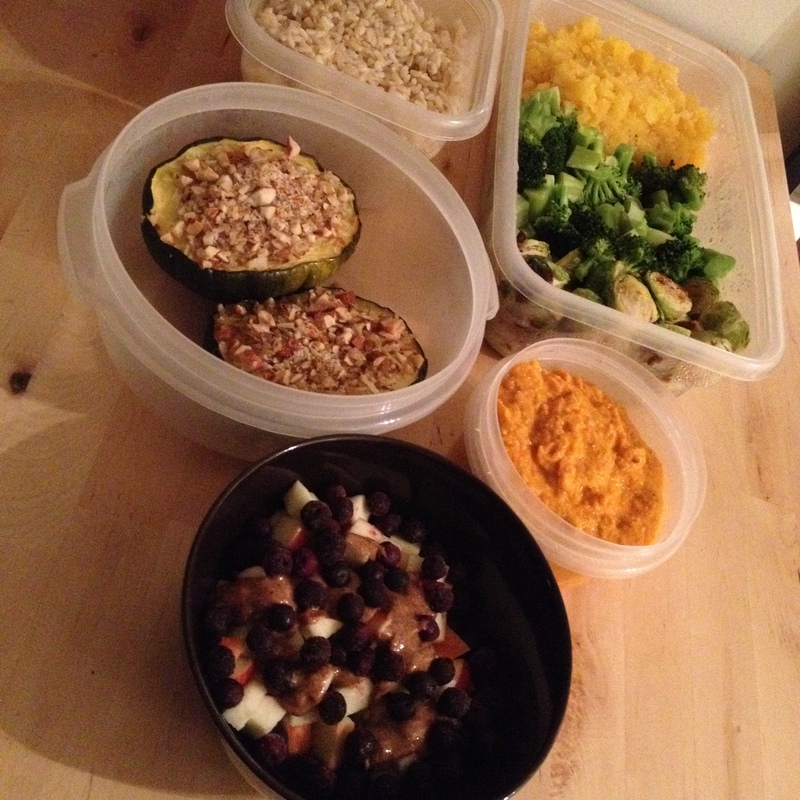 But aside from the lack of bananas, I could definitely see myself continuing to eat this way. I think I’ll need to become a little more creative in the snack department, and I don’t think I could totally give up yogurt forever, but for the most part these are most of the same foods I regularly enjoy. One of the main reasons why I wanted to give this a shot is because from now until mid-October I am training for event after event after event. I’ve got the Sun Run in April, BMO in May, a triathlon in July, Seawheeze in August, a Strong (wo)Man competition in September, and the Rock n Roll half marathon in October. Training season has officially started and it’s time to stop seeing Eggo’s and froyo as acceptable post-workout meals. Also over the next couple of months I’ll be sharing what my training is looking like, just for anyone who is interested. I’ll of course be keeping up with FitTip Fridays and my other random ramblings, but for those who are interested I hope to share some more free workouts and recipes to keep you full of energy and ready to take on the day. If there’s anything you’re interested in, let me know and I’ll see what I can do! 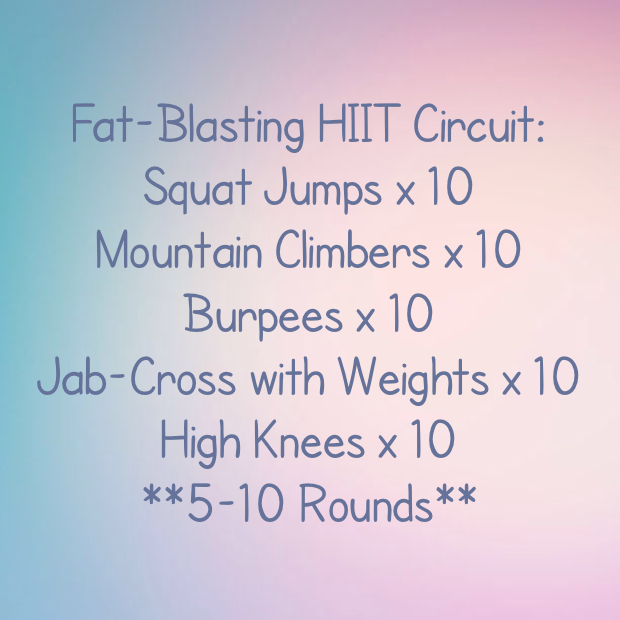 This HIIT circuit I came up with yesterday is a little more on the advanced side and should take under 20 minutes, depending on how few rest breaks you take. Perform 10 reps of each exercise 5-10 times. When I started I had the goal of completing 10 rounds. By round 3 I said “screw it I’m only doing 5”, but they go so quick that by the time I got to 4 I felt like I could deal with 7. And before you know it I had 10 rounds done! If you’d like to give this a shot but aren’t too keen on jumping around, don’t fret! These exercises can be modified to make this slightly less intense but still good enough to make you feel the burn. Trade the squat jumps for regular squats, take the jumps out of the burpees and just step back to your plank, don’t use weights for the punches, and just march with those knees up nice and high at the end. If you give me a shot let me know how it goes! This entry was posted in Diet, Fitness, Workouts and tagged cardio, clean eating, diet, exercise, fitness, healthy-living, HIIT, motivation, nutrition, personal training, strength training, weight loss, workout, workouts. Bookmark the permalink.